Hair Fair 2015 is officially open! I was fortunate enough once again this year to be selected for early access. I have to say, the sims look magnificent, and they are easy to navigate. I have no doubt that they will be much laggier than I experienced since I know they will be packed, but persevere! It is well worth the patience required. 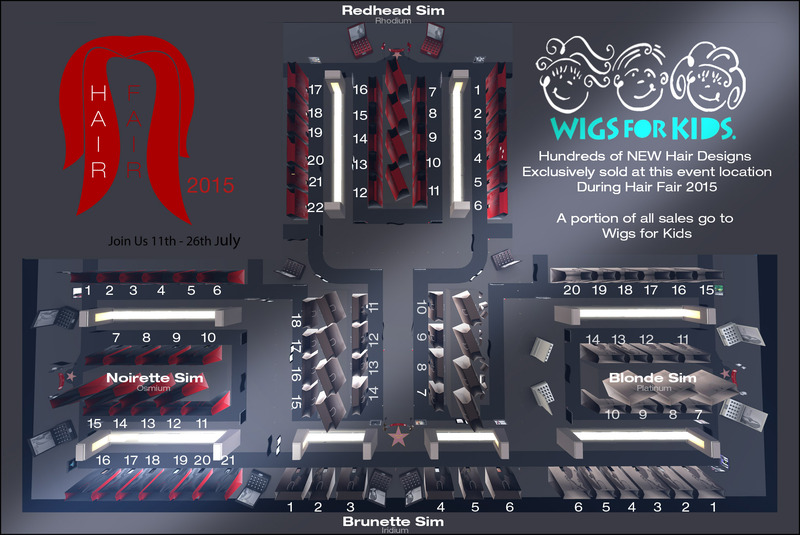 While you wait to get in, you can join the Hair Fair Demo Group, and this year, there are two additional adjacent sims you can cam shop from. For the details, read on. Full instructions for joining the group and slurls to all of the sims can be found later in this post, or by checking the Hair Fair website. This year, as I have in the last two years, I found a “new to me” hair designer that I just love! [kik]hair is my find this time around and I am sporting it in my lead photo. And if you venture beyond the cut, you can see more – plus all of the Hair Fair info I promised and a surprise! The hair in my first photo is called Banksia, and I just adore the scarf! You can change the colour from the HUD and it comes with a separate accessory in case you want to wear it on its own. Following with the scarf theme is Zinnia, another cute style from [kik]hair. I’m a sucker for short cuts with fringe, so of course, this was the first one I grabbed. The scarf is separate, in case you want to wear the style alone, but you can click the band to select one of five colours. Not just cute, but functional, as well! The last thing I want to talk about in this post is Bandana Day. Bandana Day is 26th of July where we remove our hair to show we care. All bandanas sold at hair fair have been created by Residents all over SL and 100% of sales of those go to Wigs for Kids, and are only available for sale during this event, and destroyed after it ends. They will be transfer, so you can gift them. However, bandanas are on sale all through Hair Fair and there is a Bandana Booth on every sim. Also be on the lookout for bandanas by Studly Lockjaw (SL Designs) and Wendz Tempest (CozeySL). They are friends of mine and MUCH better at making bandanas than I am! But what is really most important is that before you start breaking the bank on all of the lovely hair you make your first stop the Bandana Booth to find (at least) one that is just you. ?Stores that have Mens hair included in their release will be shown with a * Many styles however are able to be worn by males, and vice versa, so use the demo group as a way to try everything in advance.